Starting in the first years of the 20th century with short documentary films, newsreels have had a long tradition of being glued together as a program. Newsreels were produced by different film production companies. After 1930, the films were accompanied by music, sound, and vocal commentary. They addressed a variety of topics, among which are politics, cityscapes, disasters, fashion, animals, and sports. But until the end of their era, the structure of the newsreel remained nearly the same. It started and ended with set opening titles (“Anfangsmarke”) and end credits (“Endemarke”), consisting of a picture and a musical theme. Intertitles separated the 8-15 news items (for a total viewing time of 10 minutes). A wide variety of material was used for an item’s design: newspaper headlines, photographs, film snippets, and animation. But animation was not only inserted as a story, but also was used in the opening titles, the end credits, and the intertitles. While in West Germany in the 1950s several newsreel productions existed in a highly competitive market, in East Germany only one state-controlled newsreel was produced. Due to the competition of West German newsreels, the opening titles and end credits belonged to the ‘brand’. The opening titles (and the end credits) consisted in a turning globe on which the letters of the newsreel’s name casted a shadow (fig. 1). Fig. 1. 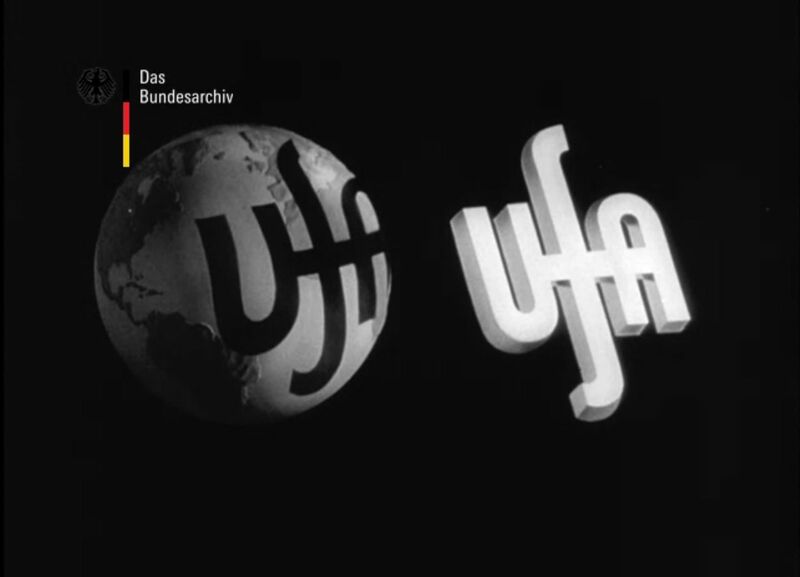 From the opening titles of Ufa-Wochenschau (1965). 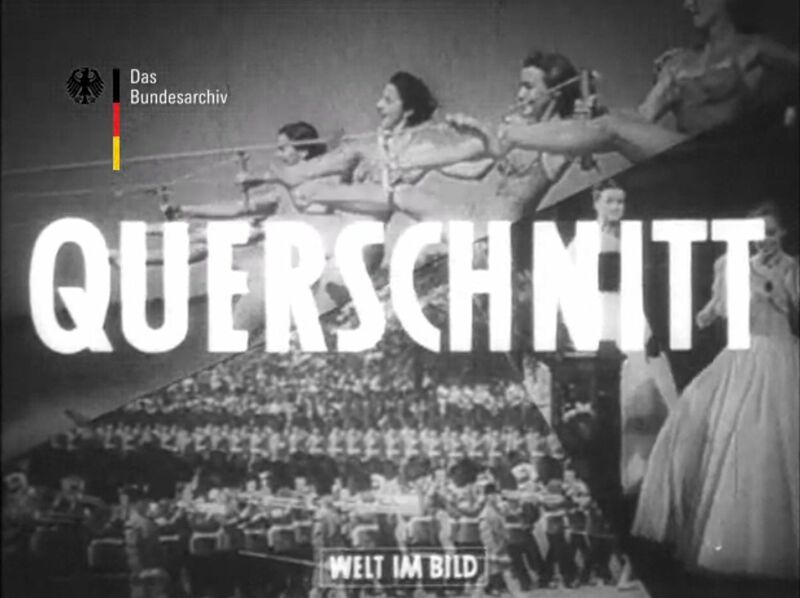 In the early 1950s, the opening titles of the Neue Deutsche Wochenschau (NDW), however, show a globe embraced by a filmstrip, and points from the capital cities flown on this tape, forming the letters of the newsreel’s name (fig. 2). Fig. 2. From the opening titles of NDW No. 12 (1950). Since the opening titles were a part of the brand, they rarely changed. As a matter of fact, viewers complained when they recognized that it had changed. The newsreel company of NDW started a questionnaire among cinema owners, asking them about their opinion. If the reaction was negative, they immediately changed the opening titles for the following edition. The West German newsreels also used printed paratexts (for example, posters and tables of contents for showcasing in cinemas) which followed the special brand style as well. 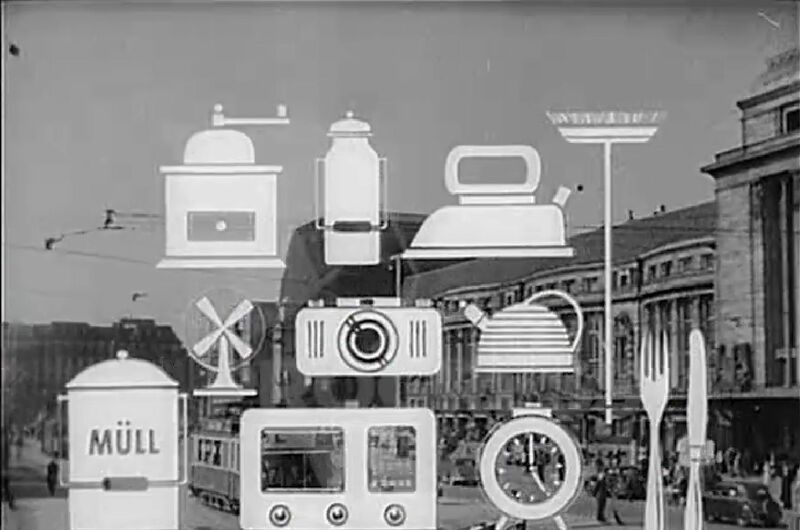 As the East German newsreel didn’t face any competition, the opening titles often changed. They did not show the globe, but a turning camera, film-snippets with symbols of economic progress (e.g. planes or new buildings), or emblems of political events, which were important for the planned economy (fig. 3). Fig. 3. 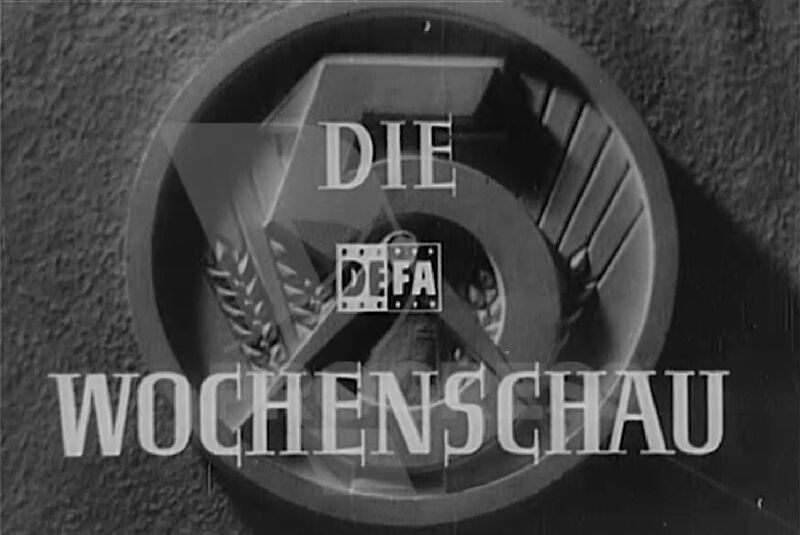 Emblem of the Five-years-plan, “Fünfjahres-Plan”, from the opening titles of Der Augenzeuge No. 21 (1954). Thus, the opening titles were not only an example of applied animation, but also an important symbolic paratext, which impressed the political conditions in the Cold War era. In contrast to the newsreels in West Germany, whose opening titles and end credits carried only the name of the film distributor, the opening titles of Der Augenzeuge also listed the names of cameramen, editors, and directors. Intertitles instead carried animated writing, which appeared in different ways, sizes, and styles, sometimes rotating. They set the expectations of the viewers: the writing style, as well as the way they appeared in combination with music, could be dramatic in the case of a war report or industry report, or bright and calm in the case of a fashion show, seasonal, or cultural topic. Sometimes, the city or country where an incident had taken place was displayed transparently, so that the first pictures of the following report were recognizable in the background (see fig. 4). Fig. 4. 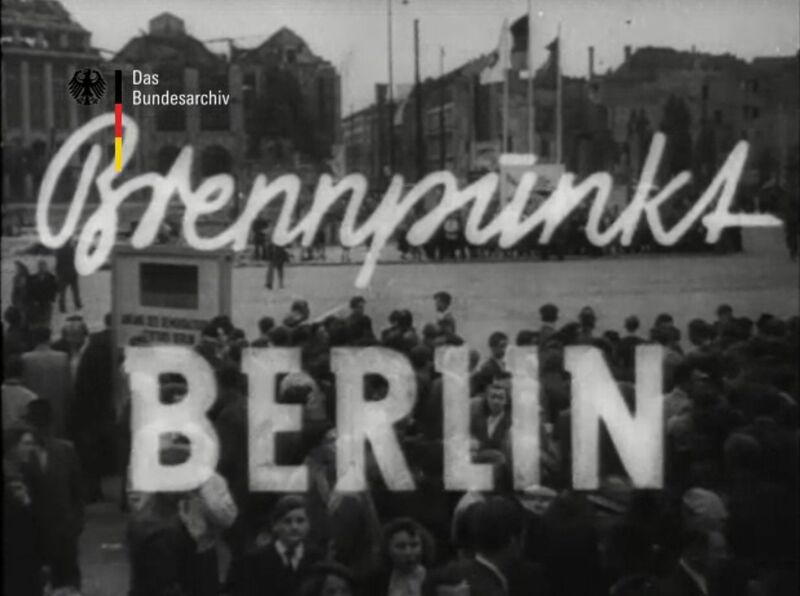 An intertitle of “Hotspot Berlin”, from NDW No. 18 (1950). Some of the intertitles were created for recurring sections, like “Aus dem Zeitgeschehen” (fig. 5) or for the sports section (usually positioned at the end of an edition). Fig. 5. An intertitle of “News of the Time”, from NDW No. 81 (1951). These sections were formed by up to six short reports without any intertitle, but were often separated, for instance by a quick pan shot, or the live-action picture of a turning camera. In the mid-1950s, Der Augenzeuge especially seems to have invested a lot of time in animating the sections’ titles with word-image combinations. This is for instance the case of “Sonne, Sommer, See” (fig. 6), and “Mehr-besser-billiger” (fig. 7). Fig. 6. 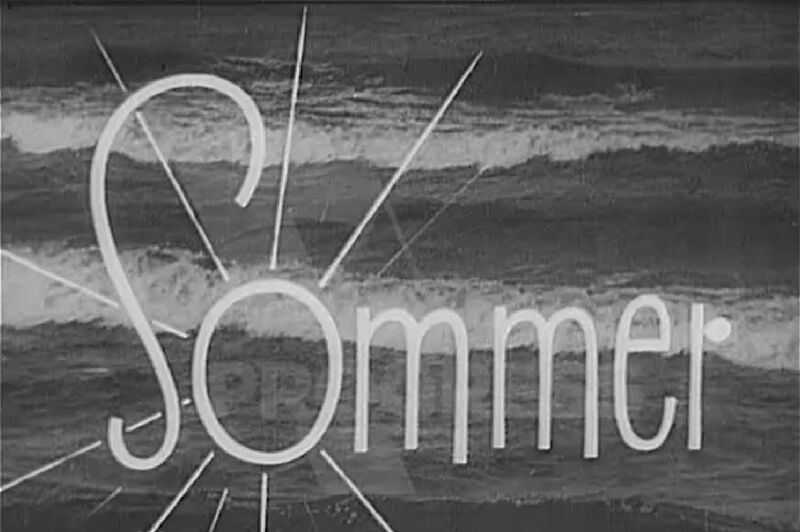 An intertitle of “Sun, Summer, Sea”, from Der Augenzeuge No. 34 (1955). Fig. 7. 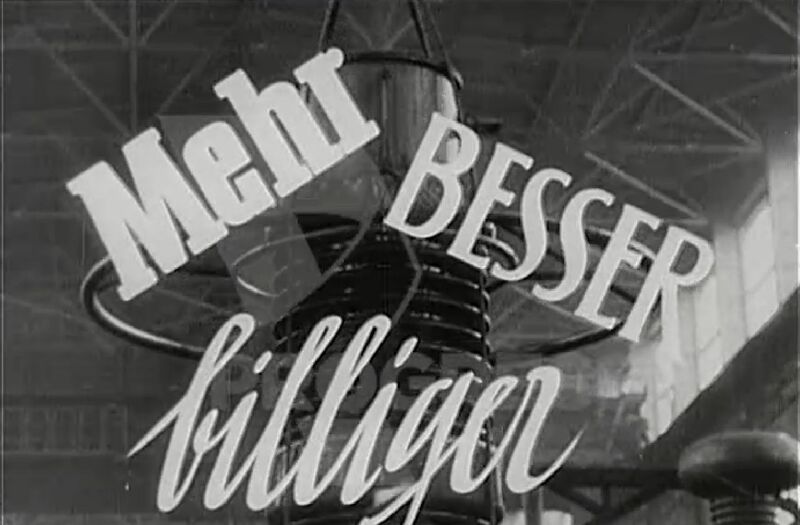 An intertitle of “More, Better, Cheaper”, from Der Augenzeuge No. 23 (1955). 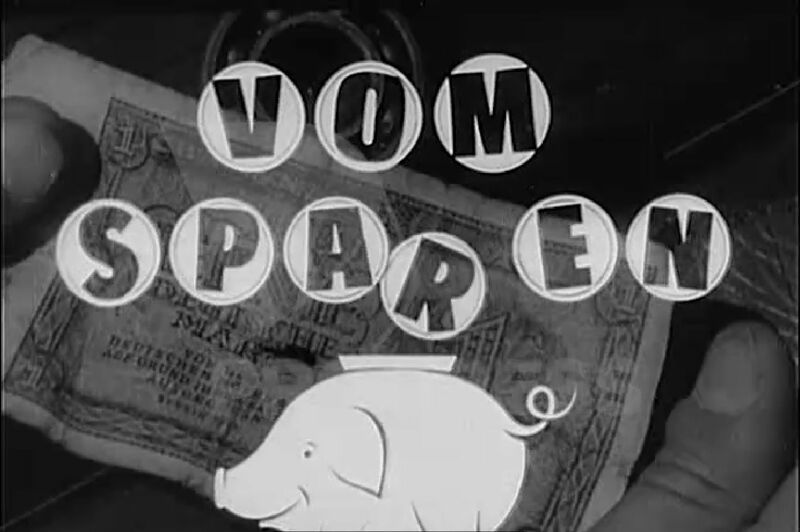 However, animated intertitles were used for single reports as well, as it has been the case for “Vom Sparen” (fig. 8) or “Massenbedarfsgüter” (fig. 9). Fig. 8. The intertitle of “On saving money”, from Der Augenzeuge No. 37 (1955). The words and signs moved, appeared, and disappeared on a live-action film background picture. Fig. 9. An intertitle of “Household mass-requirements”, from Der Augenzeuge No. 43 (1955). The West German newsreel Welt im Bild used, for example, a split-screen style with different very short film clips (fig. 10). Fig. 10. An example of the use of the split screen from Welt im Bild No. 32 (1953). But intertitles were not always used when different topics followed each other. The lack of intertitles also had a special meaning. In those cases, the viewer probably builded up associations between the reports. The first opening title of NDW (used from No. 1 to No. 11) was created and produced (positive film and editing) by Hans Fischerkösen and cost 1500 DM. The globe may have been a model, and the letters casting a shadow on the globe may have been made with a mask (“Maske”) in front of the camera lens. Due to the time pressure in newsreel production, it is highly likely that the other titles were created by the production companies themselves. The writing, letters, and other design elements were obviously drawn on transparent sheets (“cels”), and the slightly different elements on each cel were photographed one-by-one as single frame shots (a traditional animation technique). Following this, they seem to have been copied onto the first meters of film of the report. In sum, the animated paratexts of newsreel films had several functions. 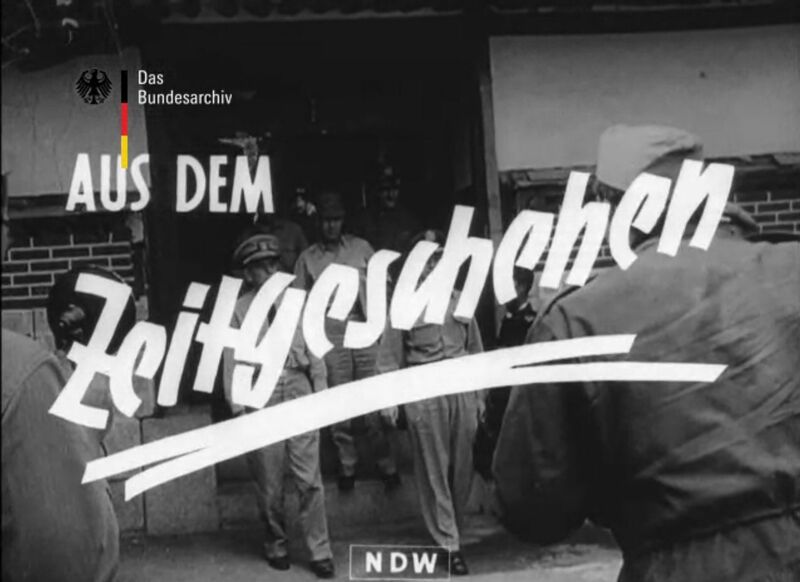 Through opening titles, political and media-political influences were expressed, and for West German newsreels, they served as a marketing tool for branding and to enable the viewer’s recognition. Intertitles separated reports, structured an edition, proved authenticity, prepared the viewers’ expectations, and could serve image-building about the state’s economic progress. By the end of the newsreel’s era, the design of paratexts had changed (for instance the typographical styles were different), but the functions had not. The weekly newsreels were presented in the pre-programs of cinemas until the 1970s. Two newsreels, Der Augenzeuge in East Germany and Blick in die Welt in West Germany, were even produced until the 1980s. Intertitles in silent films were tables with dialogic text or information on the story. They could separate films in acts. In newsreels, intertitles (as the expression is used here) served as openings for single items or sections. Neue Deutsche Wochenschau (NDW) was renamed to Zeitlupe in 1963, Welt im Film was followed by Welt im Bild in 1952 and renamed to Ufa-Wochenschau in 1956. Fox tönende Wochenschau, Blick in die Welt. Inserted pictures from West German newsreels can be found at www.filmothek.bundesarchiv.de, and those from Der Augenzeuge at www.progress-film.de. In the opening title for NDW No. 50, the music was too vivid, and the globe was turning too fast. Cf. Geschäftsbericht für die konstituierende Aufsichtsratssitzung der NDW, January 28, 1950, folder Protokolle Aufsichtsrat 1949-1952, NDW-Bestand, Film- und Fernsehmuseum Hamburg. Additionally, the music was timed exactly to the sequence. I thank illustrator and graphic designer Anke Eißmann, Edoras Art, Herborn, Germany for hints on the possible production process of the titles. The NDW hired a graphic specialist (a freelancer), who attended the meetings of the editorial team. His drafts of the titles were then executed by the trick department of the postproduction company Geyer-Werke (“Kopierwerk”) in Hamburg, which was located very close to the newsreel company (thanks to Klaus Brandes, cinematographer at NDW in the 1950s, for this information). 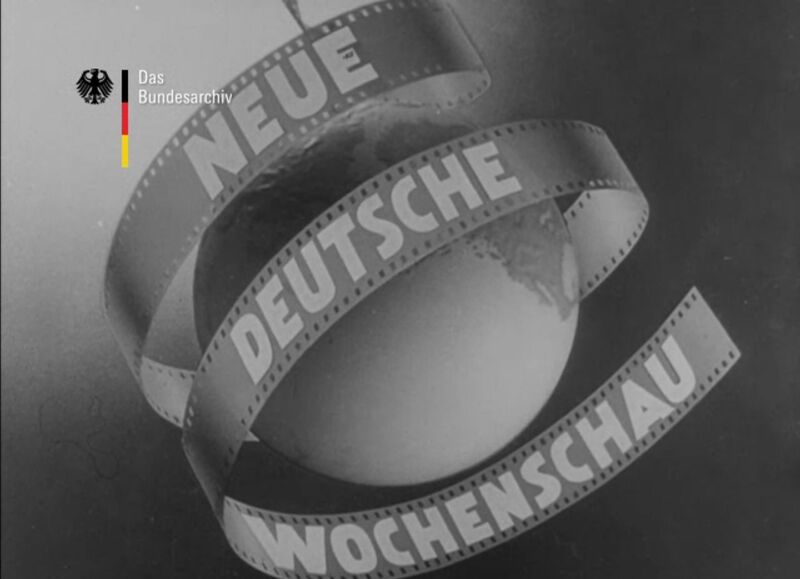 However, the East German newsreel, produced by the state Deutsche Film AG (DEFA), used at first a special department of the DEFA in Berlin-Johannisthal for the production of titles. Beginning in 1952-1953 the DEFA-studio for newsreels and documentaries (DEFA-Studio für Wochenschau und Dokumentarfilme) ran its own trick-department (thanks to Günter Jordan for the information). These pictures make me feel nostalgic about the old era of german newsreels.